For some reason, I never really cook pork. We just don't eat a lot of it, and as such, I never really have it in the house. A couple of weeks ago, pork tenderloins were on sale, so hubs picked up a couple of packages to stow away in the freezer. On Sunday, I popped one into the fridge, thinking that I would cook it Monday night. 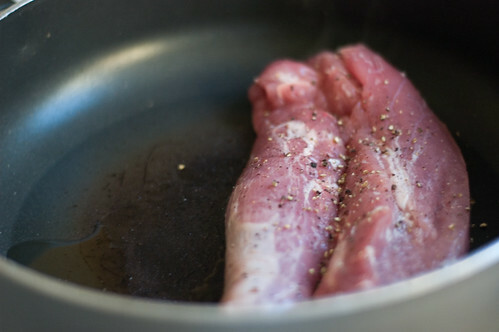 Pork tenderloin is a super versatile cut of meat - initially, I'd been thinking of trying a Thai-inspired stir-fry (coconut milk, thai curry paste, fresh basil, fish sauce, etc. ), but I still wasn't really in the mood for that....so I ended up hunting around and found a fabulous and simple recipe on Cooking Light. I highly recommend this - it's company worthy, easy to make and very tasty. 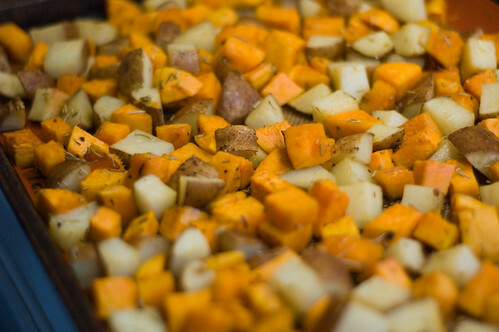 I like the simplicity of the ingredients, and it was a great complement to mixed roasted white and sweet potatoes (actually, it would have been just sweet potatoes, but when I asked hubs to pick them up, they were all teeny tiny....so I supplemented). 1. Toss the cubed potatoes with olive oil, garlic, salt, pepper, rosemary and cumin. 2. Put on the bottom rack of a 400F oven. Toss every 20 minutes - cook for 40-50 minutes. The longer, the better, IMHO. 2. Butterfly each pork tenderloin, cutting to, but not through, the other side. 3. Open halves, laying pork flat. Sprinkle each side of pork with 1 1/2 teaspoons pepper. Heat oil a large ovenproof skillet coated with cooking spray. 4. Add pork; cook for 2 minutes on each side. 5. Place the pork in a 9x13 glass pan (spray with cooking spray first) and bake at 425° for 12 minutes or until meat thermometer registers 160° (slightly pink). My pork was in for closer to 20 minutes....and it was a bit pink in the middle. If you like your pork not pink, I would suggest starting with 15 minutes, and checking every five minutes after that....my tenderloins were quite thick, even butterflied. 6. 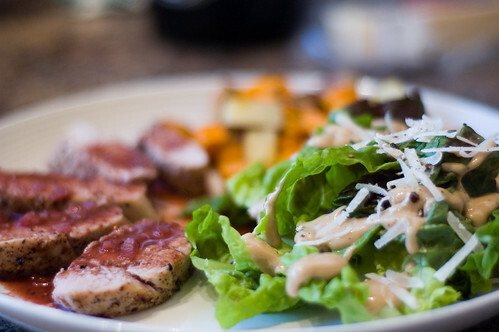 While the pork is in the oven, assemble your sauce ingredients and add the wine and shallots to the pan. Bring to a boil. 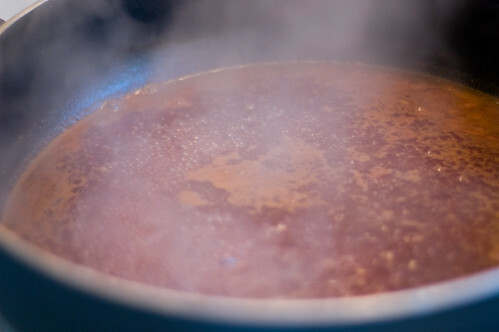 Add broth and remaining ingredients to pan; stir well with a whisk. Bring to a boil over medium heat; cook until reduced by about half. 7. With a sharp knife, cut the pork into medallions about 1.5 cm thick. Serve with sauce. Cooking Light tells me that one pork tenderloin should serve four people. I tell Cooking Light that perhaps they should consider testing their recipes on people who have NOT undergone gastric bypass....generally, one regular sized tenderloin will serve 2 people. Three if you are dieting. I served this with a green salad (with parmesan on top) and the roasted potatoes above. :) YUM. The pork was very moist, the sauce was super tasty and the cumin in the potatoes added just a wee touch of exoticism that really heightened the meal. Two thumbs up from me, and hubs sarcastically told me it was 'pork-tastic' after I bugged him for feedback. the mixed roasted potatoes look absolutely gorgeous! yum! 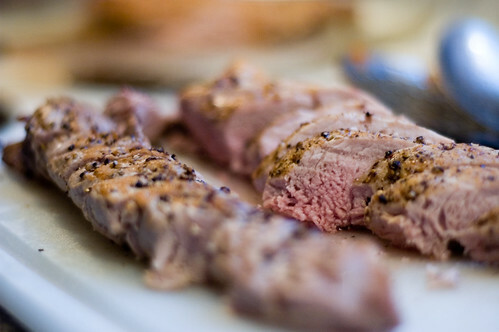 I'm a total pork tenderloin fan. I usually always have one in my freezer. And this sounds wonderful! 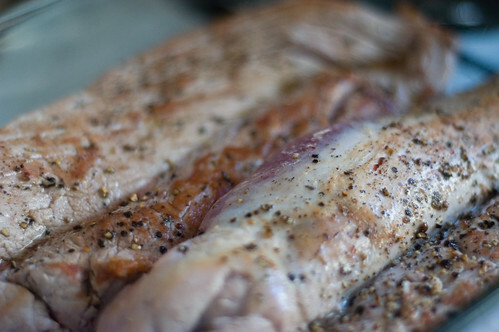 Pork can definitely be an underrated meat. That recipe looks delicious! It reminds me of a dish that I used to make a lot - sweet potatoes, pork tenderloin, cilantro and black beans. I'll have to give this one a whirl. Thanks! P.S. You have a wonderful blog. It's a great read. Drool! 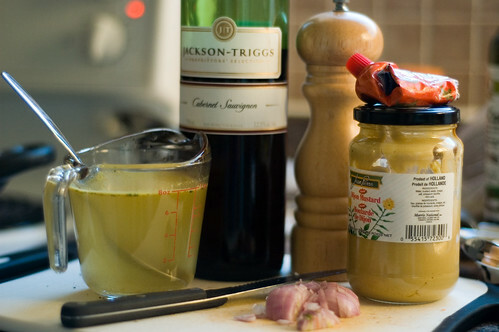 Must try this recipe…then again, anything with wine gets my vote! And I totally agree with you about pork loin servings – one would NEVER feed 4 in my house! We split it in 3 at most but usually gobble the whole thing up between hubby and I.
Glad to see you back at the blog. It's always nice to see new recipes...yummm! Oh my god! I totally made this!!! Honestly, it's probably the first time I have made a savory recipe that I found on a blog....consider yourself officially special. Thanks for posting, as it was awesome (porktastic indeed). I ignored the whole "healthy" thing and added a touch of cream to the wine sauce. chicken. with a side of chocolate.